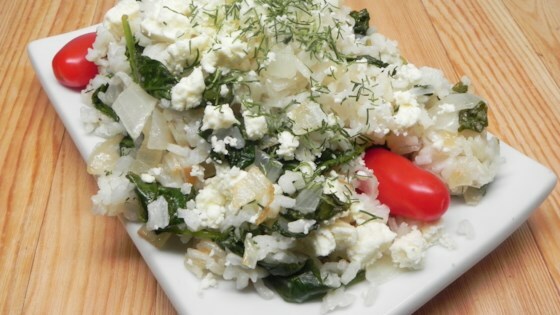 "A fabulous Greek rice dish with dill, spinach, and lemon. Accompanies lamb deliciously as well as a side of a cool refreshing cucumber sauce...Enjoy." Heat oil in a saucepan over medium-high heat. Saute onion until tender, about 5 minutes. Add the cooked rice and spinach; cook and stir until spinach wilts, 3 to 5 minutes. Add lemon juice, zest, feta cheese, and dill. Remove from heat. Season with salt and pepper. You can use stock in place of water if desired. The number of servings reflects side-dish-sized portions. Please adjust accordingly if making as a main dish.